Did you set an intention for how you wanted this day to go? Our mind is a powerful collaborator. When we set an intention, the mind will seek out evidence that supports your intention. Our beliefs and intentions create our reality by leading the mind of a scavenger hunt for evidence. Without intention, life often resembles a pinball machine. We bounce from one event to the next with seemingly no control. Do you want to co-create a more enjoyable life? Take a moment and choose your mood and experience. When you notice the day is running you, pause and take three deep breaths. In through the nose, out through the mouth. Feet flat on the floor. Feel your consciousness fill your body. Take three more normal breaths, assess what needs to get done, choose the mood you wish to experience, and begin again with mindful intention. 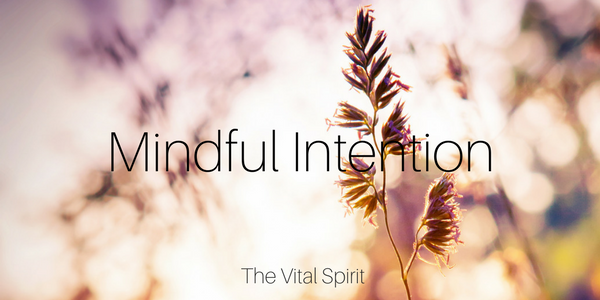 Interested in receiving weekly Mindful Monday updates by email? Join The Vital Spirit mailing list. Laura Rowe is an intuitive energy healer. Living in Portland, Oregon, Laura founded The Vital Spirit, an entity that seeks to be an instrument in the ongoing shift in human consciousness. Laura works with adults who identify as highly sensitive persons or empaths and are committed to learning about who they are and how they want to express themselves in this world. She helps these individuals clear energetic blocks, release limiting beliefs, thrive in their business/careers and navigate interpersonal relationships so they can live life to the fullest.